Headquarters Company, No. 1 Platoon. Victoria Point, Tavoy, Moulmein, Thanbyuzat, Kendau 4.8km, Thetkaw 14 km, Meiloe 75km, Augganaung 105km. Ronald Lumley Evans is twin brother to Kenneth Samuel Evans WX17269. The Evans family arrived from England in Western Australia in December 1923 from London on the ‘Hobson”. The twins aged about 4 years, there was one sister and two other older brothers. Ron enlisted first on 13 December 1940. Ken on 15th October 1941 in ‘E’ Company, Special Reserve Battalion. Although in different Battalions, the brothers were together at Selarang Camp Changi whilst in Singapore. They were then drafted into ‘A’ Force Burma and Green Force, No. 3 Battalion. 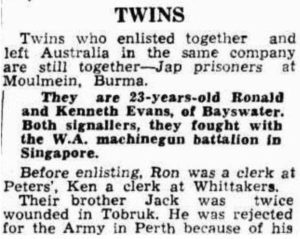 The brothers managed to be together in several camps but were separated after Chunkai when Ken went onto Tamuang & Ron went to Linson Wood Camp. Ron was recovered from Thailand at the end of war. He was transferred on 2/1st Hospital Ship ‘Mununda’ from Singapore via Labuan to Fremantle. The above was printed in October 1943.